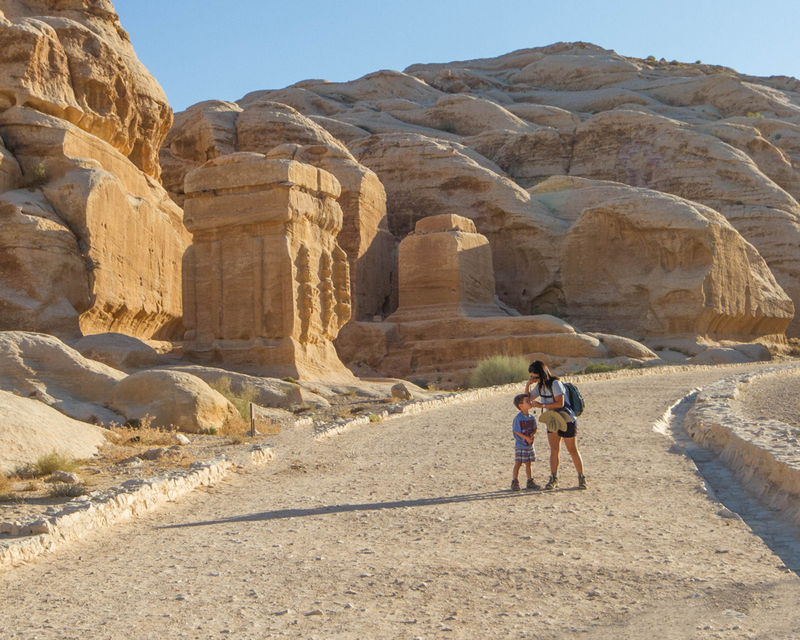 If you’re here, the thought of visiting Petra with kids has crossed your mind. And that makes you amazing! 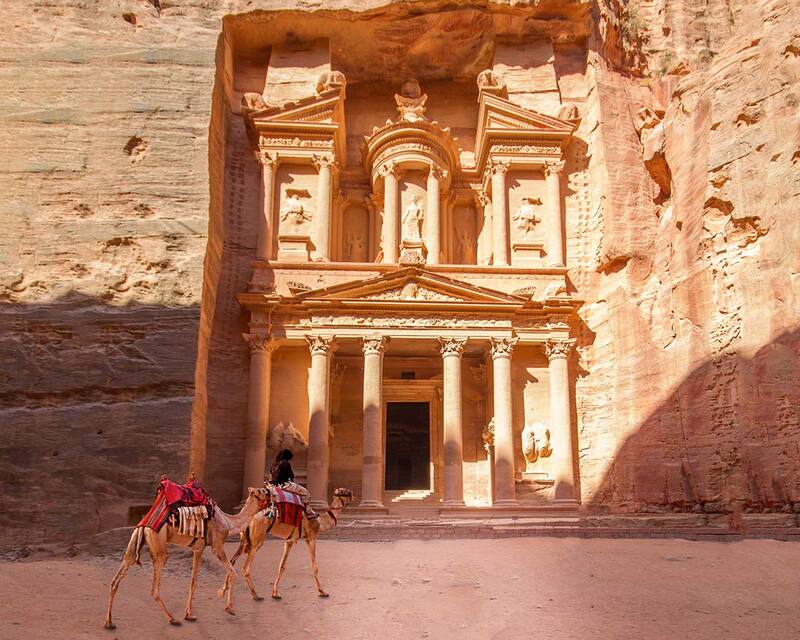 There is no place in the small country of Jordan that is more iconic than the ancient city of Petra. And that is saying a lot for a country as ripe with natural and historic treasures as Jordan. Even with incredible family destinations in Jordan like the Dead Sea and the Martian landscape of Wadi Rum, Petra still holds the imagination of the world, becoming listed as one of the New 7 Wonders of the World. Petra is also somewhat of a media icon, appearing in movies such as Indiana Jones and the Last Crusade. But if you’re thinking of visiting Petra with children, you have a real treat in store for you, because visiting Petra with kids is an unforgettable experience. 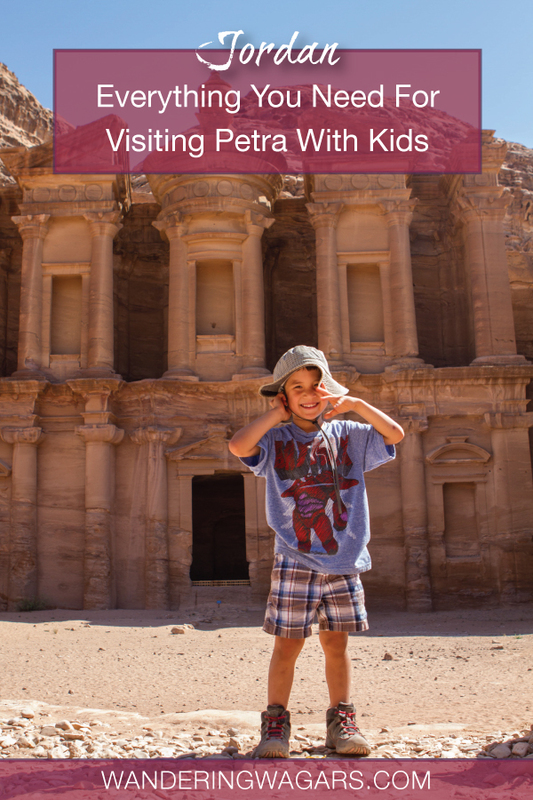 Our ultimate guide to visiting Petra with kids will give you everything you need to know about what to see in Petra, where to stay in Petra, and how to manage your time once you are here. 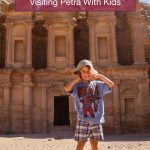 Is It Safe To Visit Petra With Kids? 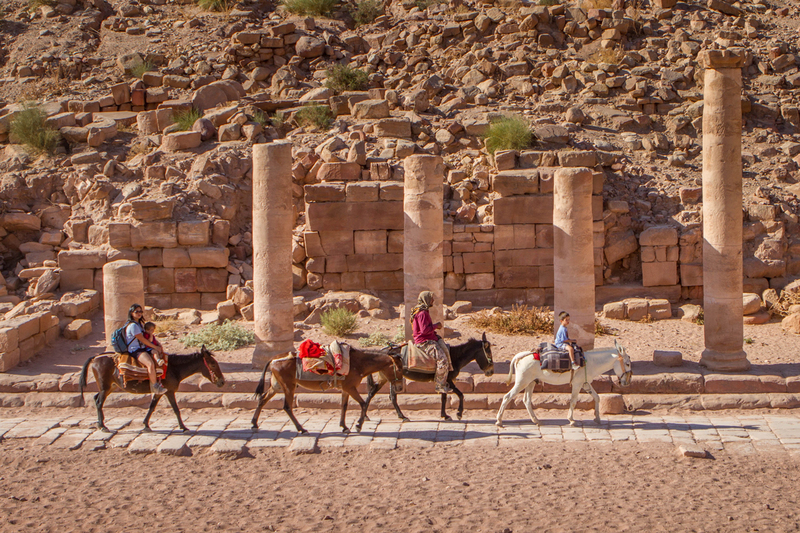 How To Get Around Petra With Children? 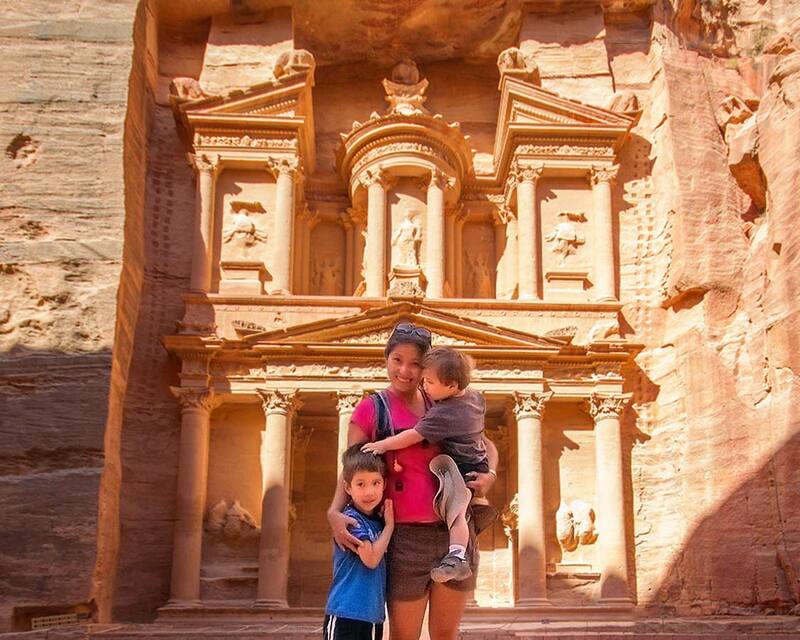 When Is Best Time To Visit Petra For Families? 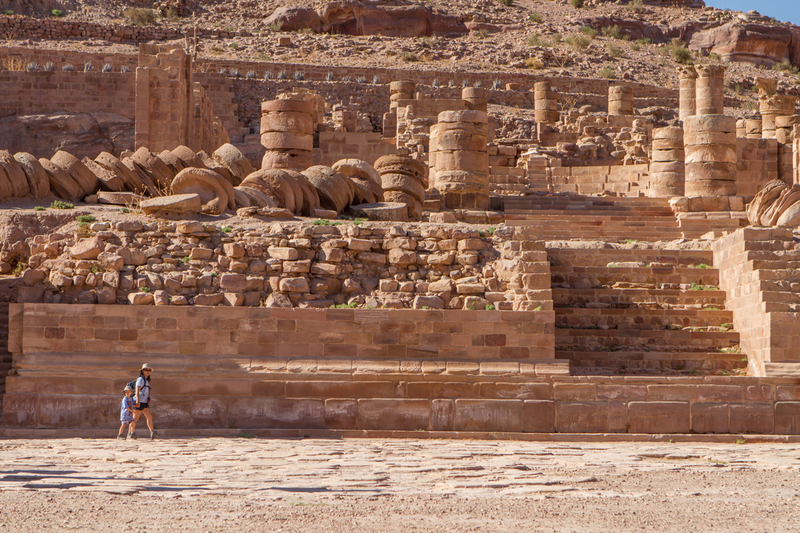 The Rose city of Petra Jordan dates back to the 1st Century BC. 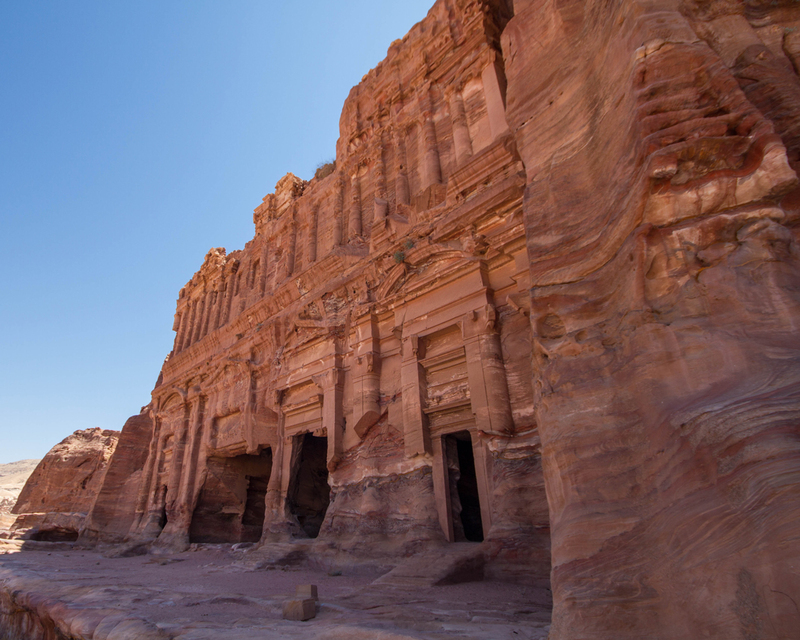 It was literally carved from the mountainsides during days of the Nabatean Empire. All this work was to create the capital of the empire and solidify the city’s position along key trade routes like the Silk Road. Around 106 AD, Petra was absorbed by the Roman Empire and the city continued to grow. A century later, the city of Petra came to a sudden and dramatic end. History is unclear as to what exactly spurred the decline in this famous city. Some have attributed the collapse to an invasion by the Persian Sassanid Empire, while others have put the blame on natural disasters such as earthquakes. Regardless, by 551 AD, the city of Petra Jordan quickly fell into disrepair and was all but forgotten by the outside world until 1812 when Swiss explorer Johann Ludwig Burckhardt rediscovered the site. Until his re-discovery of Petra, many people believed that it was actually the city of Kerak that was the city of Petra. 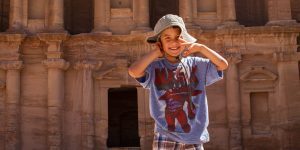 There are few things to be concerned about if you are a considering traveling to Petra with kids. 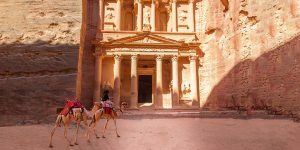 While most of the Petra complex is safe to explore, there are very few security precautions in place, and there are steep drop-offs in many places, especially near the Royal Tombs, the Monastery and the High Place of Sacrifice. The other thing to be careful about when visiting Petra with children is the horses and carriages when approaching the siq and the Treasury. The locals tend to ride these animals hard up the paths. It’s best to be aware of your surroundings and listen for the sound of approaching hoofs so that you can get out of the way in time. The City of Petra is in the town of Wadi Musa, about 3-hours and 240 km south of Amman and 120 km north of the resort town of Aqaba. It’s impossible to miss the entrance to Petra as there is a small tourist village set up there with a modern visitors center, gift shops, and restaurants. 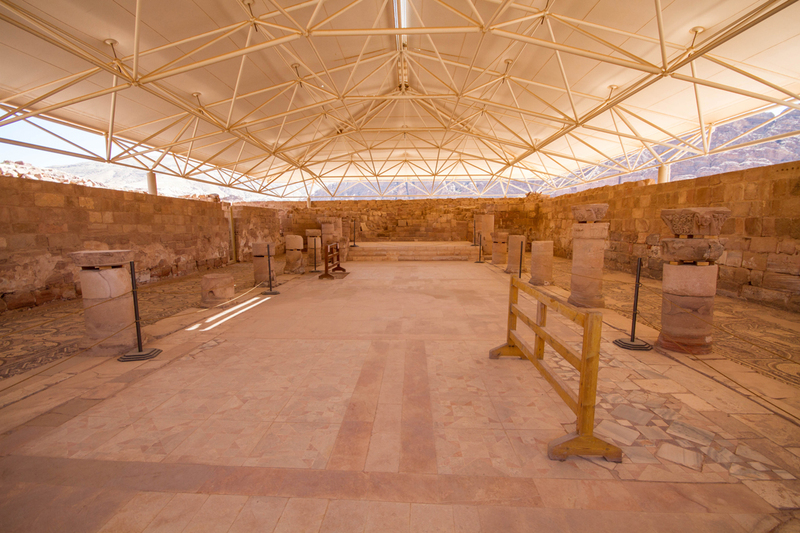 The Petra complex itself sprawls over 60 sq. km among the Petra Mountains. 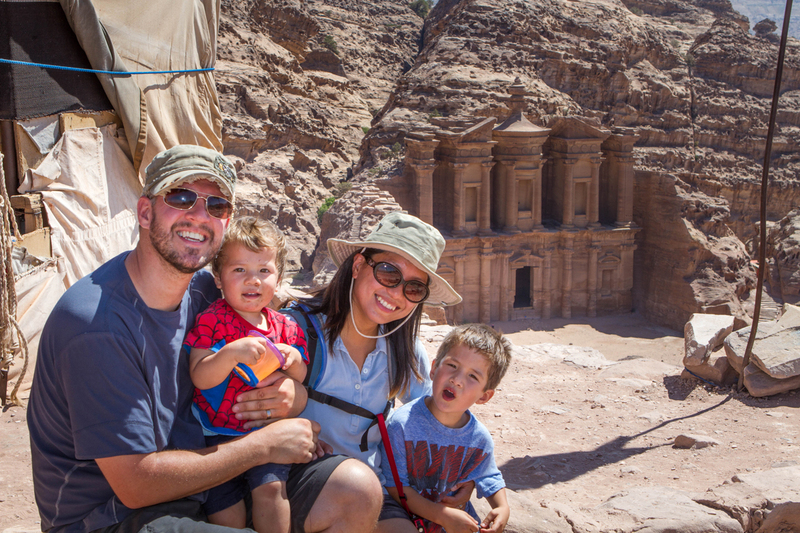 It was hard to wrap our minds around what to see in Petra with kids. While some visitors might spend a few hours to see the Treasury and the main road, most will only spend one day in Petra. But we wanted to see ALL of it, so we ended up spending three days exploring the area to help us make the most complete guide to Petra for families that we could! Once you get through the Petra Visitor Centre you begin the 2.2 km journey through the siq and to the iconic view of the city, the Petra Treasury. But getting around Petra requires a LOT of walking. Be prepared with some good hiking shoes, because you will need it. But for those visiting Petra with limited mobility, or visiting Petra with young children, there are a few options to help get around Petra. There is a hierarchy in the Petra transportation options though, so, if you want transportation in Petra, read this closely. Pro-Tip: If you decide to ride into Petra rather than walk, make sure you negotiate the price openly with the guides beforehand. The horses will only take you to the opening of al Siq, but the carriages can go all the way through to the Treasury. 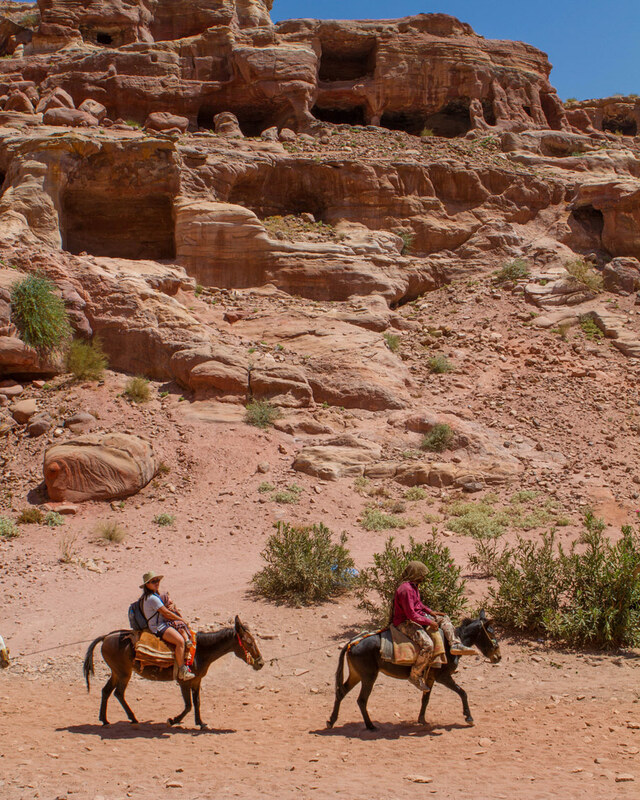 Just past the Petra Visitors Center is a stall packed with horses led by local Bedouin guides. 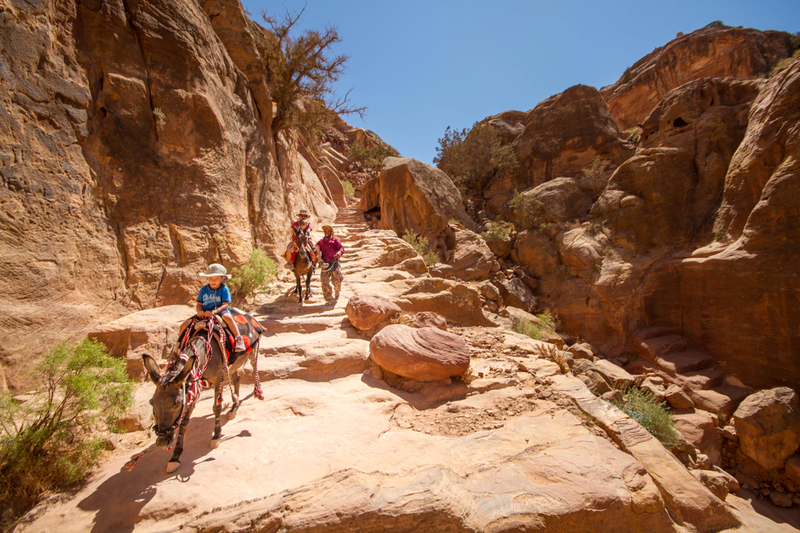 These guides offer horseback rides to the entrance to the siq and no further. 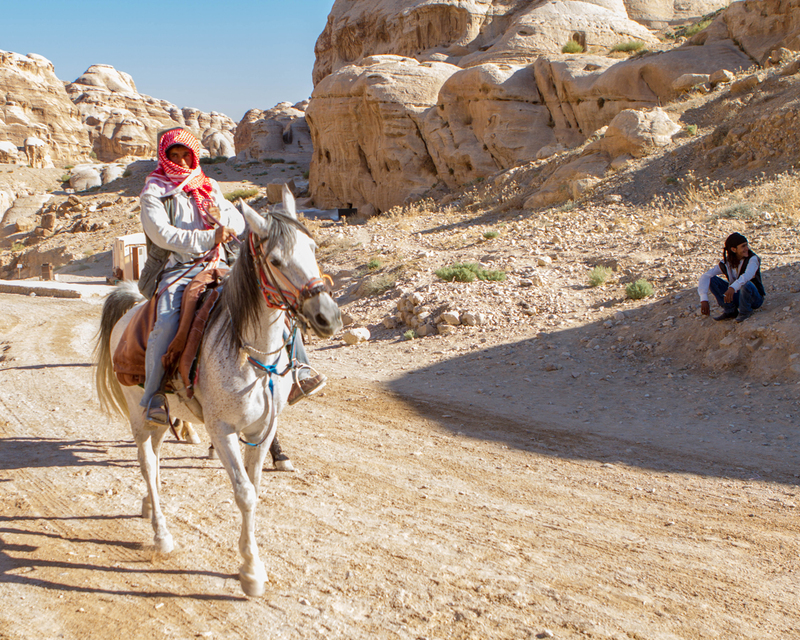 If you decide to ride a horse to Petra, make sure you negotiate a price first. And be aware that this ride will only take you the 1 km to the entrance of the siq. There is a further 1 km within the siq that will need to be done on foot. For those with limited mobility or the elderly, you can also hire a chariot to bring you straight to the Treasury. There are a limited number of these, so you may need to wait until one comes back. 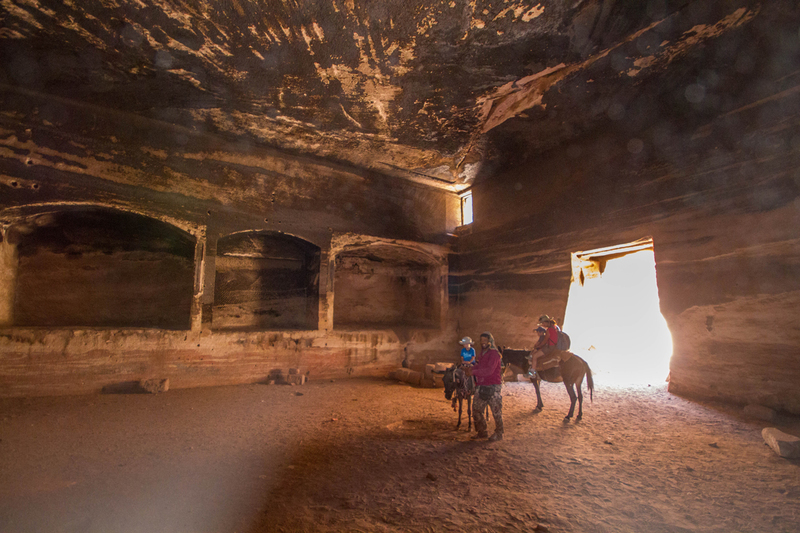 Many of the horses in Petra are not treated well, so please look for signs of abuse before you consider hiring one. 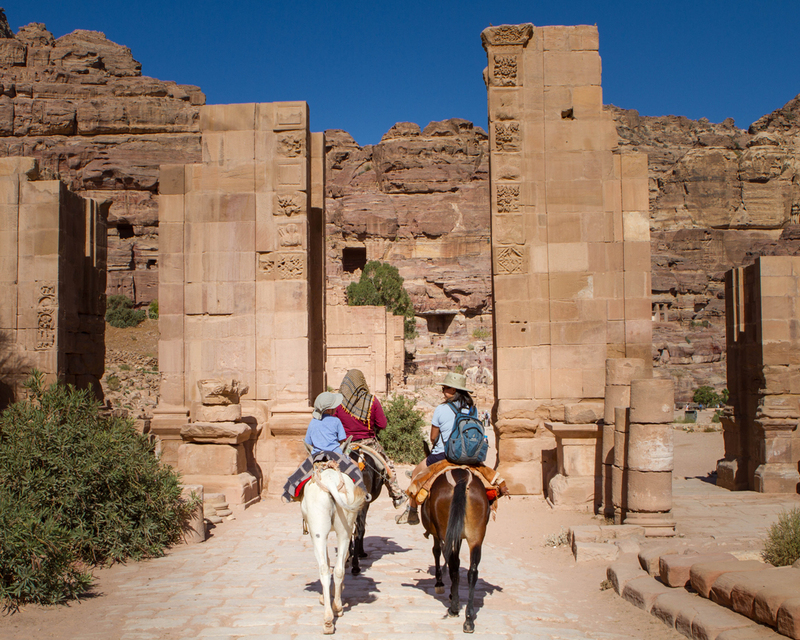 Once you arrive at the Petra Treasury you will find a number of camels for hire. The Petra camels can be hired for those wanting to visit the lower levels of Petra. The camels are an iconic symbol and tend to be better cared for than the horses. They are allowed at the entrance to Petra for photo opportunities. 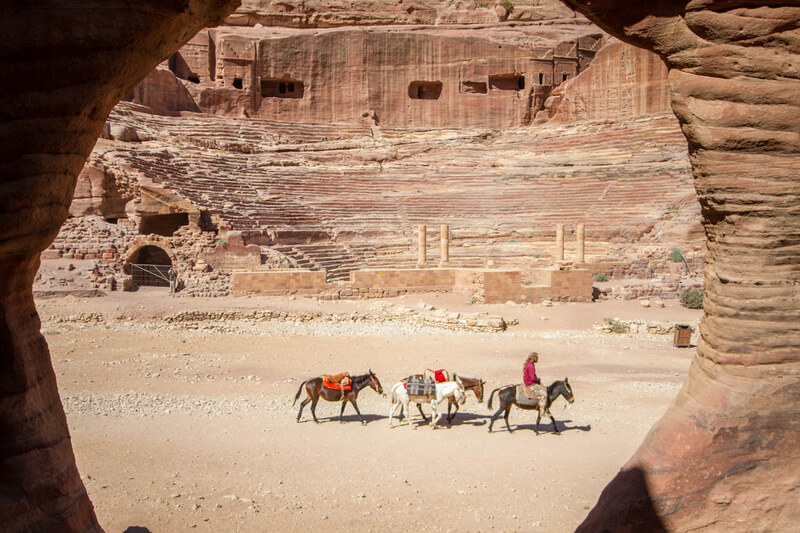 Most people who hire a Bedouin guide in Petra will have access to a donkey. This was our option of choice, mainly because, with all of my camera gear, two small children, and a day’s worth of supplies, I wanted to make sure I would have the energy to explore Petra properly. By hiring a donkey for our 3-year-old C, and one for my wife and 1-year-old D, they would be able to make the journey without being exhausted. 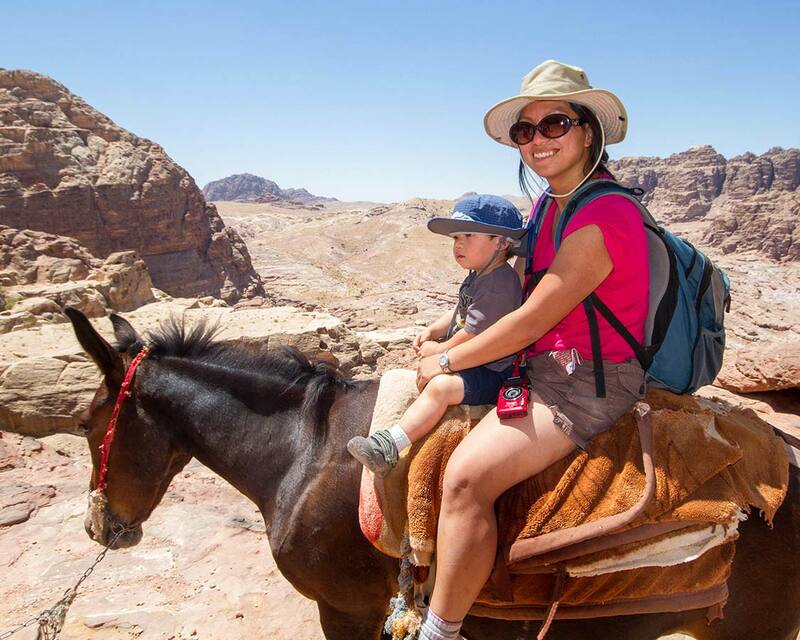 Hiring a Donkey in Petra also means that you can travel to the higher places within Petra with kids, such as the Monastery and the High Place of Sacrifice. To find the donkeys you need to walk around the first corner after the Treasury building. Exploring Petra on foot is the best way to experience this city. While Christina and the boys were on donkeys, I carried the gear and explored on foot. Part of this was so that I could run around and get photos, and the second is that, with my big body and heavy backpack, I would feel bad for any mule that had to carry me. 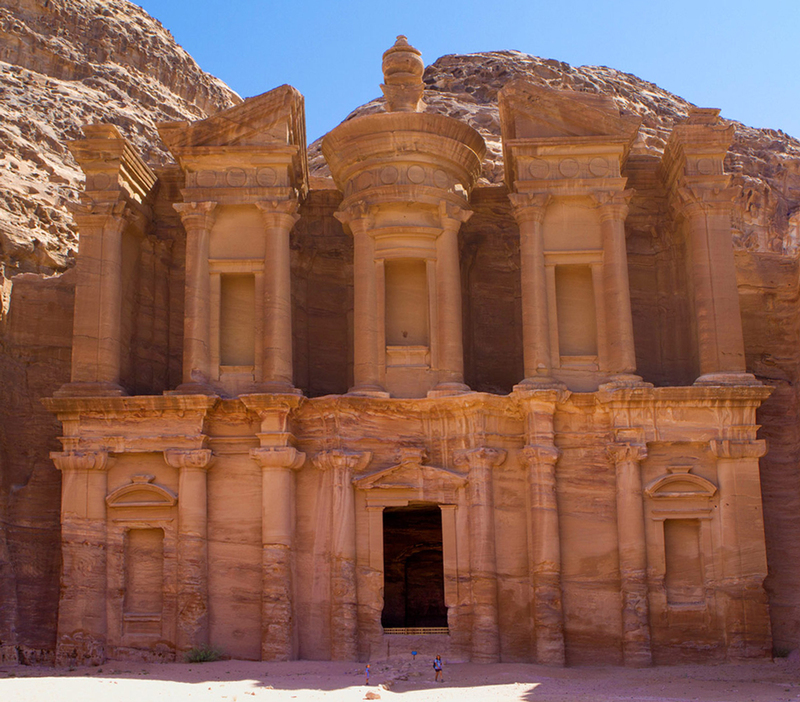 Getting to the famed Petra Treasury involves a 2.2 km walk from the Petra Visitor Center. The first 1.2 km of the journey is along a wide canyon with ruined temples and buildings on either side. The views along this route can easily be overlooked by those rushing towards the Treasury in Petra, but it shouldn’t be. 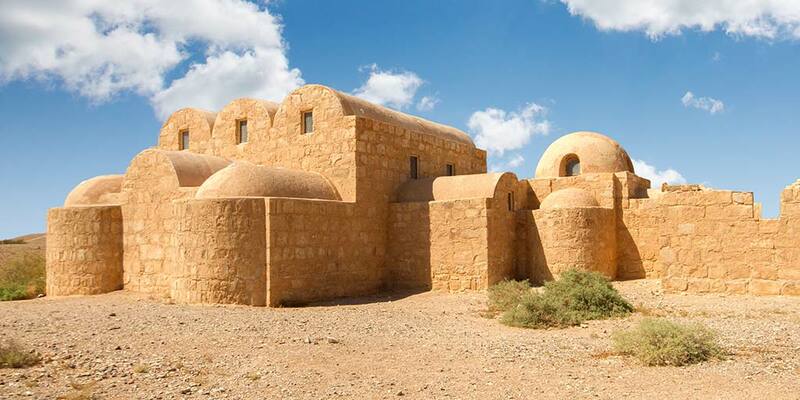 Many of these buildings represent the best version of the Nabatean architecture. The amazing sites along the walk to Al Siq can often be overlooked in the excitement to get to the majestic buildings within Petra. As our eyes began to adjust to the bright sun, we quickly noticed the various shapes among the mountains surrounding the paths. Lining the mountain walls were towering Obelisk tombs, caves, and columns. The tombs are the most spectacular site on the way to Al Siq. There are several that you can explore along the way, the largest being three stories of towering sandstone. The reliefs along the front offer witness to the Arab, Egyptian, and Roman occupation of the region. Pro-Tip: The drive to Petra from Amman can be accomplished by three methods: 1) by renting your own car, 2) by joining a tour, or 3) by taking a bus. The Siq, or Al Siq is where experiencing Petra becomes very dramatic. The cliffs rocket skyward and we entered a narrow passageway that stretched for nearly a kilometer. The siq was key to defending the city of Petra from invaders, as any attackers would need to funnel through this narrow passageway. As we approached Al Siq we passed over a bridge. To the right was a small store built into the cliffside. This is the only place to get drinks and snacks till the Treasury, 1.2 km away. As we entered the Siq, we were instantly dwarfed by the towering 200 m cliffs. Many visitors to Petra rush through the Siq to get to the main city. But that is a shame. Al Siq offers some stunning sites. And if it were anywhere else, it would be a destination of its own. The walls are lined with niches that once held sacred statues for Nabateans making the pilgrimage to Petra. Many of these niches are still visible today, although most have been badly eroded. Also visible are the remains of once detailed sculptures illustrating Petra as one of the key trading hubs in the region. One of the best preserved shows a man leading a group of camels through the Siq. 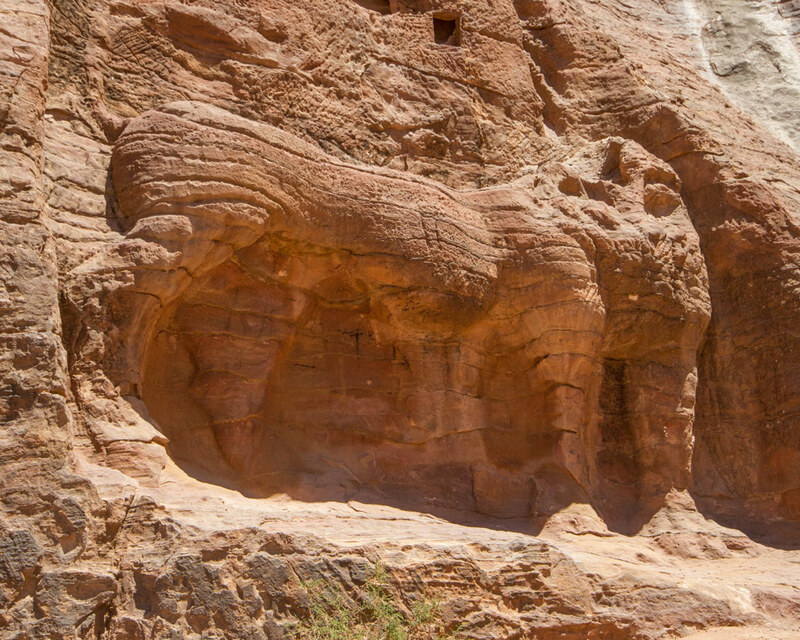 The best thing about exploring al Siq in Petra with kids though is the Elephish. C could have spent hours wandering around this amazing rock, that from one side looks like an elephant. And from the other side, looks like a fish! Nature has a great sense of humor. As our feet began to tire from the long walk through the Siq, it happened. The view. THE VIEW! As we saw the towering Treasury building, illuminated by the sun through the dark walls of the Siq, our exhaustion disappeared. The Treasury is where countless visitors swarm, sipping a coffee and snapping photos with the camels. There are a few shops and small restaurants here to grab some refreshments. Unfortunately, this is as far as many visitors go. The view here is incredible, but the Treasury building in Petra is really where the tour of the lost city of Petra begins! Pro-Tip: If you want to hire a guide to show you around the area, this is where you do it. Camel guides, which can lead you to the lower areas of Petra are available here, but donkeys and horse guides wait around the corner and aren’t allowed directly in front of the Treasury. Lower Petra consists of a few different areas that can easily be explored on your own. But a guide will help you get a better understanding of what you are seeing. 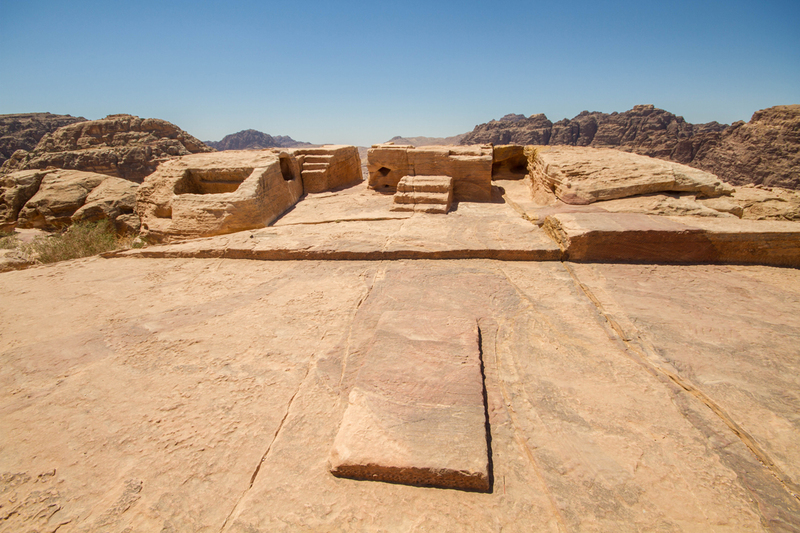 On the right-hand side, after a row of tall and magnificent tombs is the largest house in Petra. This three-story cave house features huge rooms that the boys loved to explore. The home holds a coveted spot in the city, directly across from the Theater. The Theater was built out of solid rock about 2000 years ago for an audience of 3,500 people. The amphitheater in Petra was expanded by the Romans in AD 106 to hold as many as 8500 people. It reminded me of a much smaller version of the amphitheater we had seen in Jerash. Along the Petra cliffs, to the right, the wadi widens immensely. On the right is a long line of the most spectacular tombs. You can access them by following along the cliff, or from a staircase from the lower floor of the wadi. The Royal Tombs are the most elegant of all of the buildings in Petra. The walls are finely detailed and there are multiple levels to each of the buildings. Pro-Tip: When you are exploring the lower tombs, be prepared for the smell. They are often used by goat herders for shelter during the rain. As we rounded the corner from the Theater we came to the Colonnaded Street. The start of this stretch is marked by a 450-year-old pistachio tree. The tree makes a great spot to stop and grab some shade and eat some lunch. There are a few small shops nearby as well as a washroom. Along the colonnaded street sits the remains of the Nymphaeum and the Great Temple. We entered the Great Temple through the wide staircase at its base. Christina and C headed deeper into the ruins to explore. I, on the other hand, got to do one of the coolest things when visiting Petra with kids. Changing a diaper on a 2000-year-old ruin at one of the 7 wonders of the world! At the end of the Colonnaded street that marks the outer rim of the main area of Petra sits the Temenos Gateway. These massive pillars once held huge wooden doors and separated the commercial district from the sacred temple. On a rise above the Colonnaded street is the Byzantine Church. The remains of this building, covered by an awning, features a stunning mosaic floor. It was built in 530 AD but was destroyed by a fire and subsequent earthquakes. Pro-Tip: A small cafe near the Petra church has outhouses that you can use. Heading back towards the Theater, we met up with a local Bedouin guide to take us up to the High Place of Sacrifice. The High Place of Sacrifice can be reached via a long series of switchbacks. Because we were at Petra with kids, we opted to have Christina and the boys take horses for the trip while I would carry our gear on foot. Our guide, Mohammed with the gold tooth took us up the back way to give us some even more unique views. The Tomb of the Roman Soldier was our first stop on our way up the side of the mountain. This temple received its name from the elegant statue of a Roman soldier on the facade. The inside of the building is impressive on its own, with all of us inside with the horses with room to spare. We made our way to the cliffs opposite the Tomb of the Roman Soldier and began to climb up the steep steps towards the upper levels of the cliff. Christina and the boys needed to dismount their steeds and we made our way up the toward the Lion Triclinium. The Lion Triclinium was located at the top of the steep stairs in a narrow canyon. It featured the reliefs of two lions outside a tomb that was believed to have held funerary practices. We reached a wide landing where there was a small shop to get water. The horses are not allowed at the High Place of Sacrifice, so we left Mohammed and the horses at the shop and made the climb up a remaining set of stairs to the High Place of Sacrifice. When we reached the top we were met with incredible views of the Petra mountains. The peak features a flat stone landing on which is perched an altar with a large rectangular triclinium. This is where animals were sacrificed and celebrants would share communal dinners. Past the sacrificial altar, we crossed a narrow path along the dizzyingly high cliffs. The path was marked with small red arrows on the rocks and ground. 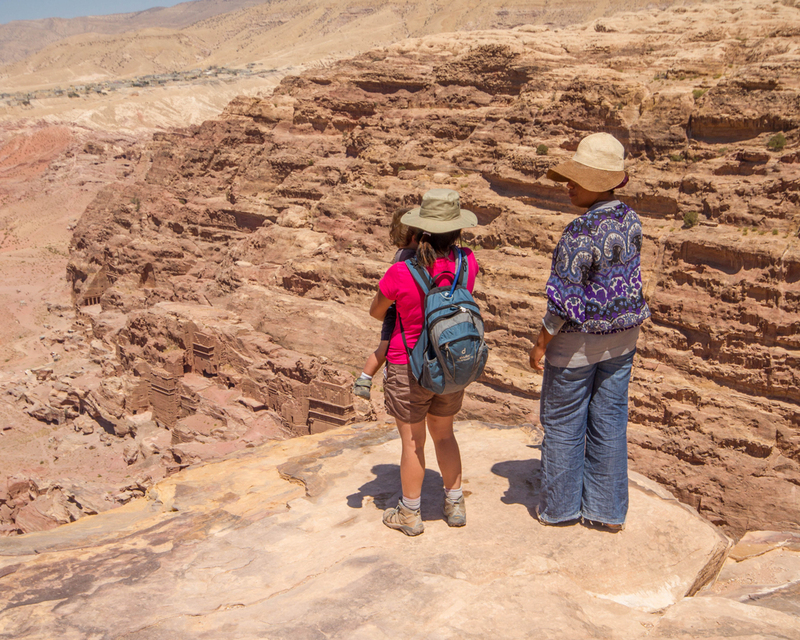 We climbed down over some rock ledges and were treated to a view over the wadi and the Royal Tombs. It was breathtaking. The grounds were nearly empty when we visited, so we were joined by a local Bedouin shopkeeper who guided us to the top and shared stories with the boys. Pro-Tip: The High Place of Sacrifice along with other High Places in Petra have sheer cliffs and no safety barriers. Please keep a close eye on your little ones everywhere in Petra, Jordan. Mohammed took us down the conventional route through many suburban style facades. The way down made for a relaxing and beautiful route. C, by now an expert at navigating his donkey through difficult terrain took the lead while D used this time to nap on Mommy’s lap. Pro-Tip: It is cheaper to buy multi-day tickets than multiple single-day tickets. If you know you will be spending more than one day in Petra, make sure to purchase the multi-day pass. The following day we returned to see Mohammed. We presented our tickets at the entrance. Then, we joined him for a climb up the 800 steps toward the famous Monastery. Christina and the boys made the journey again by horse, while I desperately chased them on foot (the horses won). After I finally caught up to everyone, we stopped to have a snack. We left the horses and made our way up a few more steps and around a bend. The corner took us to a wide clearing littered with tumbled columns. It took a moment to notice the MASSIVE structure on our right. But there it was, the largest structure in all of Petra. The amazing Monastery building. The Monastery was built in the 3rd century BC and is an astounding 50 m wide and 45 m high. There is a cave tea shop across the plaza from the Monastery. We cooled from the heat with a delicious mint lemonade to take in the view. Our next stop would have us climb to an amazing lookout. The short hike to the lookout took us past a few more beautiful tombs with defaced carvings. When we reached Lower Petra, Mohammed pointed to the left to a series of caves on the shorter cliffs. He told us that until 20-years ago, that was his home. That was when the Jordanian government relocated the local Bedouins to a new town located just up the hill. Visiting Petra during the day is a magical experience, but taking in one of the Petra By Night experiences is a way to make visiting Petra spiritual. 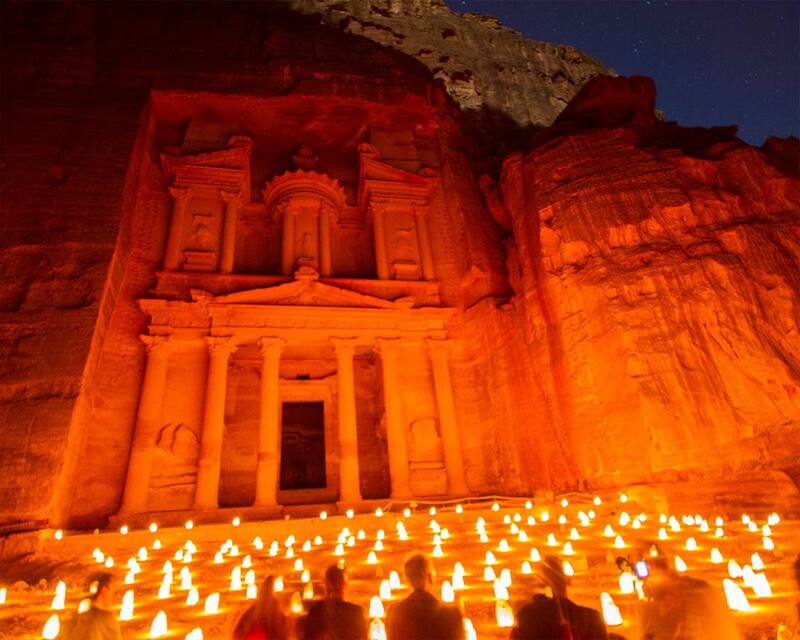 Every Monday, Wednesday, and Thursday, the 2 km path to Petra is lit with candles. Visitors are asked to walk in silence along the path as the dusk turns to night. As you leave the siq and enter Petra, the Treasury building is illuminated by 1,500 candles. These twinkling lights bring an entirely different dimension to this wonder of the world. The Petra By Night is accented by live Bedouin singing and flute playing. There is a separate 17JD entrance fee for Petra By Night. Children under 10 are free. However, you must have a valid daytime ticket to access Petra By Night. But, it is worth the extra money to have this once-in-a-lifetime experience. As we began to make our way down towards Mohammed we came across a Bedouin shopkeeper selling headscarves. We had spoken to her briefly before we made our way up to the Monastery. This time we decided to take her up on her offer of mint tea and some shade in her shop. We had a great conversation with her about life in Petra. She got along famously with the boys, who ended up begging us to buy some headscarves. We couldn’t resist! There are a number of tents set up throughout Petra where local Bedouins sell their goods. Most of the items for sale are trinkets and knock-offs that you can find just about anywhere in Jordan, but there are a few handmade crafts around that are worth checking out. Most Bedouins will beckon you over with a call to share tea. This is a neat trick, as in Jordan, it’s often considered rude to turn down an offer of tea. If you have the time to spare though, you can often get some great stories and conversation from these locals, and it’s worth sharing a delicious mint tea at least once or twice. Petra is an epic place full of incredible scenery, unmatched history, and unforgettable culture. It’s also huge, hot, dusty and has ZERO safety precautions. 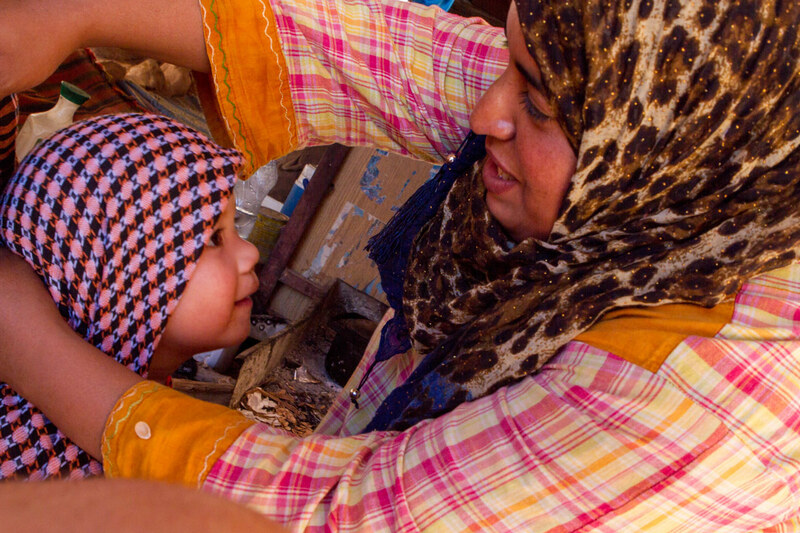 It can be exhausting for parents, and doubly so for children in Petra. Make sure you give yourself lots of time to experience the site. Petra is absolutely amazing, and it’s too good to rush through. 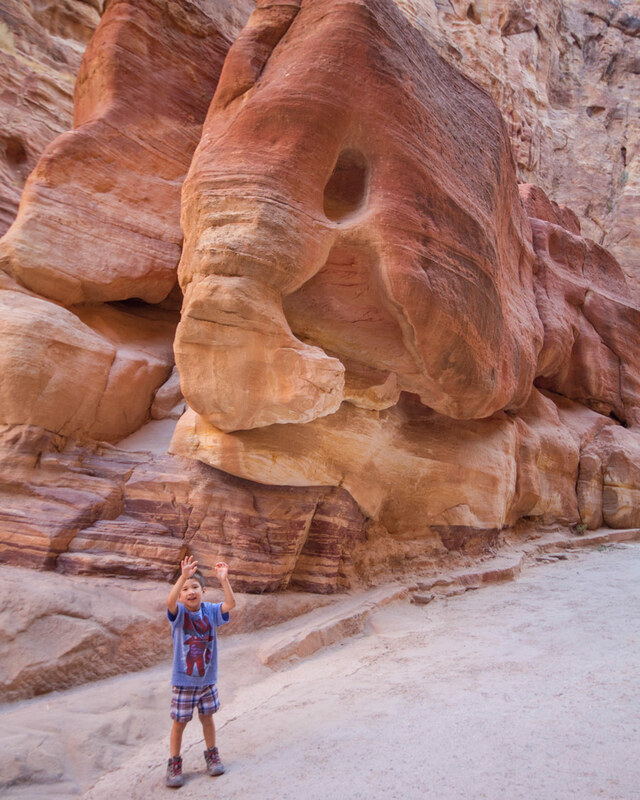 Unless you are only exploring Lower Petra, we suggest spending more than one day in Petra with young kids. Give yourself a couple of days to soak it all in. Plus, the desert heat is hard on the little ones. We did not have full days at Petra. Instead, we escaped the mid-afternoon sun by having some ice-cream in Wadi Musa. And don’t forget, after ice-cream, mid-afternoon is always a great time for a nap! Get your rest, because there is a lot more to see in Jordan with kids! A big part of traveling to Petra for kids is packing light. This goes double if you are traveling to Petra in summer. 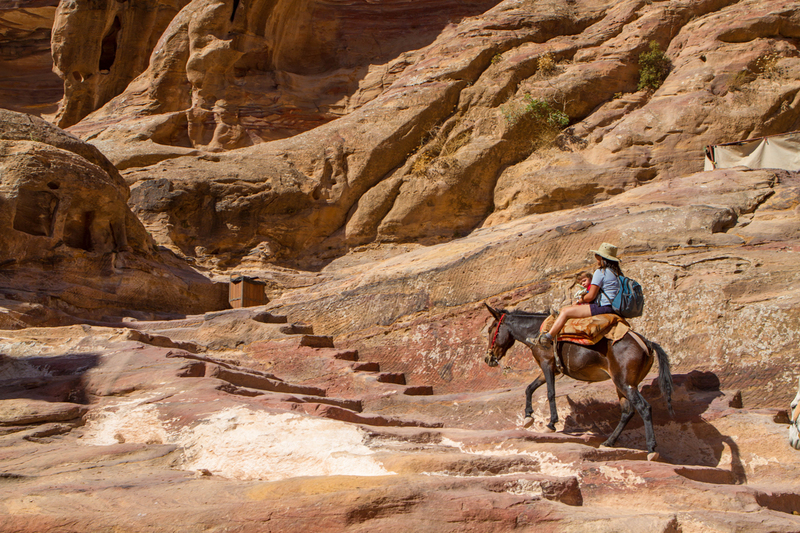 There is a lot of walking in Petra, even if you choose to hire a guide with a horse or donkey. But it still very important to pack the essentials. There are not many services within Petra, so you’ll likely need to carry everything that you need. Sunscreen – Even if you are visiting Petra in winter, bring sunscreen. There are very few areas of shade within the Lost City of Petra. Protect yourself from the sun. Wide brimmed hat – This is another key packing item. Bring a light, wide-brimmed hat to help keep the sun off your face. Snacks – We bring snacks with us everywhere we travel, and Petra was no different. Bringing light, high-energy snacks will help you power through even the longest days of exploring Petra. Water Bottle – Make sure to stay hydrated in Petra. We carried our favorite water bottles as well as a camel pack that we kept in our Deuter Kid Carrier. Guidebook – We had our Lonely Planet Jordan guidebook with us everywhere we went. Even if you hire a guide in Petra, it’s likely they won’t speak much English, so having a book on hand to interpret the sites is a big help. 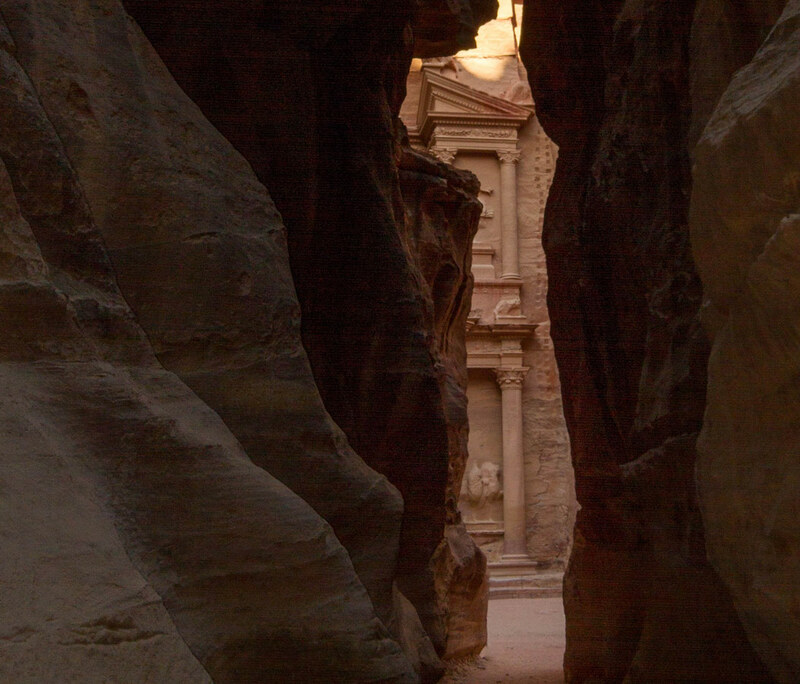 The entrance fee for Petra is among the priciest in Jordan. While many of the castles in Jordan can be visited for just JD 2, the cost to enter Petra is currently JD 90. However, if you are staying in Wadi Musa, the price is reduced to JD50 (about $70 USD). Entrance for two days is just JD 55, so it’s worth buying the extra day if you even think you might go back. There is no charge for children under 12. You may be asked to show a passport as a proof of age if your child is close to 12. If you are staying in Jordan for 3 or more days, you can save quite a bit, including your Jordan Tourist Visa by purchasing the Jordan Pass. It also includes entrance to over 40 sites within Jordan. There are lots of great restaurants in Wadi Musa that are worth checking out. And there are restaurants near the Petra Visitor Center that should be avoided. The only restaurant near the visitor center worth experiencing is the Petra Cave Bar. It doesn’t open until 3 pm, but it’s a great place to grab a cold one after a long day exploring Petra. The rest of the restaurants here are of poor quality and extreme prices. In town, head up towards the town. The Movenpick Hotel is a great place to grab an ice cream to cool off from the day’s journey. You can either go inside or order from the window off the street. We particularly liked Deretna “My Mom Recipe” restaurant. The prices were good and the atmosphere was casual and fun for children. Al-Wadi is also a great restaurant if you’re looking for some Shwarma, a classic in Jordan. There are many great options for family-friendly accommodations near Petra in Wadi Musa. The most popular hotel near Petra is the Movenpick hotel. 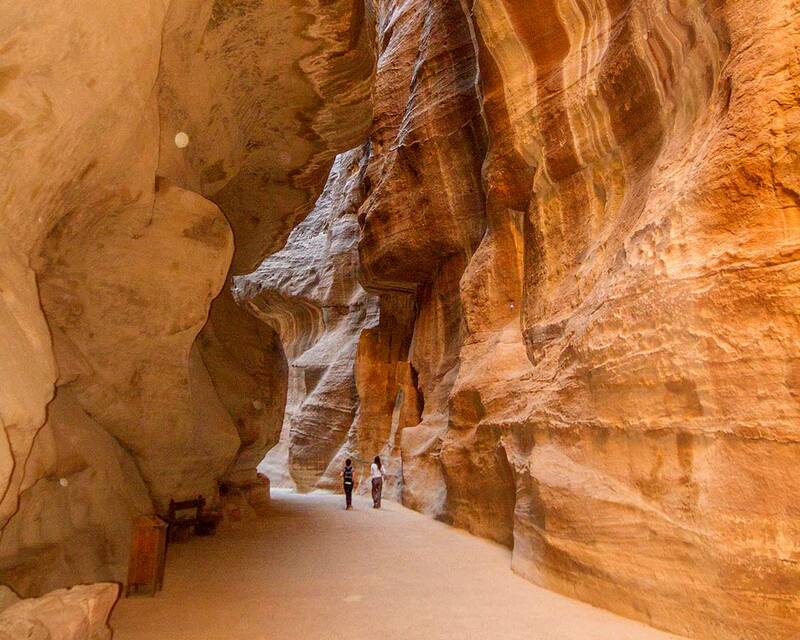 It’s an easy walk to the Petra Visitor Center and it’s beautiful inside. You can find the best prices and availability for the Movenpick Hotel on Booking.com here, on Hotels Combined here, and on Agoda here. We stayed at the Amra Palace International Hotel. Amra Palace has reasonable pricing compared to the more touristy hotels in Wadi Musa and it’s located within easy access of the shopping district as well as to Petra itself. The Amra Palace has a beautiful saltwater pool, and the restaurant patio is a perfect place to take in night views. You can check out the prices and availability of the Amra Palace International Hotel on Booking.com here, on Hotels Combined here, or on Agoda here. The Petra Moon Hotel is less than 100m from the entrance to Petra. The interior of the Petra Moon Hotel is modern and spacious. There’s a seasonal pool and easy access to groceries and shopping. You can check out the prices and availability of the Petra Moon Hotel on Booking.com here, on Hotels Combined here, or on Agoda here. The temperatures in Jordan can fluctuate quite a bit between the winter and summer seasons. Jordan summers can be blazingly hot, while the winter can be downright chilly. We went to Petra in the summer when it’s not rare for temperatures hit highs above 30C. 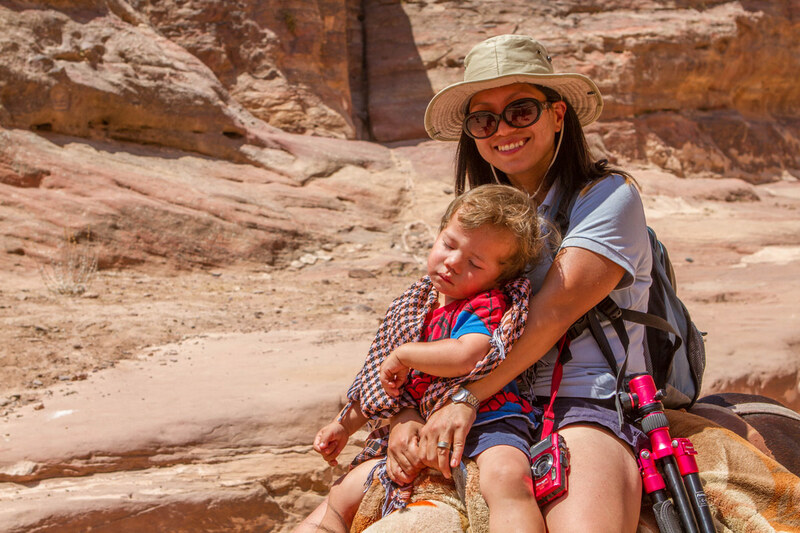 The summer isn’t the most ideal time to visit Petra with young children. Instead, opt for spring and autumn when the temperatures are much more manageable around the low-teens to mid-twenties. If you want a truly unique Petra experience, however, visit Petra in winter. Through December and January, Petra can still see highs in the mid-teens, but it can also drop below the freezing mark. The best part about visiting Petra in winter is the lack of crowds. Compared to the high season, Petra can seem virtually empty of crowds. I didn’t know the walk through al Siq was that long. But the more impressive it is that you explored so much beyond the treasury! I really love all your photos and your kids are the most lucky persons to see this as such a young age! Thank you so much Naomi. The walk is a long one for sure, but there is lots to see along the way. And our boys make amazing travel partners! That’s a wonderful exploration you took there! Do you happen to know whether or not the 450-year-old pistachio tree in the colonnaded street still carries fruits? I honestly don’t know. I know that it wasn’t when we were there, but I don’t think it was in season. I looked it up and couldn’t find any details either. Thanks for the great info. I have two questions for you. 1: Since we will be coming from Israel, (we are leaving a rental car behind) …what do you do with all your luggage? We only will be in Jordan 2 nights (Wadi Rum and Petra). We are thrilled to visit…we don’t have a lot of days for Jordan but it’s better than nothing. I assume you are referring to Wadi Rum. The camp that we stayed at (Wadi Rum Night Luxury Camp), not only was the bedding clean, but it was one of the most comfortable beds I’ve ever slept in. Different camps may have different levels of accommodation, but I haven’t heard any bad reviews of note. We were only allowed a single bag each for our visit and left our bags in our guides truck (who also stayed the night in the camp). It’s a shame that you don’t have more time to spend there, but I’m sure you will have an incredible time. Please don’t hesitate to ask if you have any other questions. Such an interesting thorough piece on Petra. I think it would be quite enjoyable to walk through Al Siq rather than taking a horse or carriage. The elephise rock would capture anyone’s attention. So many places to see in Petra. Thanks for sharing. I would love to explore Petra one day! With my family, I think we could spend an entire day in Al Siq. What incredible sights! This is superb. We are hoping to visit and I will be printing off your guide to take with us. Fantastic! Have a wonderful time on your visit and please let us know how it went! Epic comprehensive post! Thanks a lot! wow, those rock formations leave me astounded. I wonder how beautiful Petra during the ancient time? Knowing not everyone could visit that place, you are very much favoured. Hi. I just read your trip to Petra. My family with 4 children (13, 11, 6, & 2) will be traveling to Israel/Jordan next week.We’ll be in Petra from Nov 18-20, with our last day in Wadi Rum. Im contemplatingbetween a metal frame baby carrier or a front/back baby Bjorn. I’m not sure about the metal frame as I feel that it might be too bulky to haul around as we make our way to and from places. Also, we would like to visit the monastery. Is it possible to see it all in one day? Thank you. Thank you for the help. We can’t wait! Nice post and one that has helped as I am planning Petra.